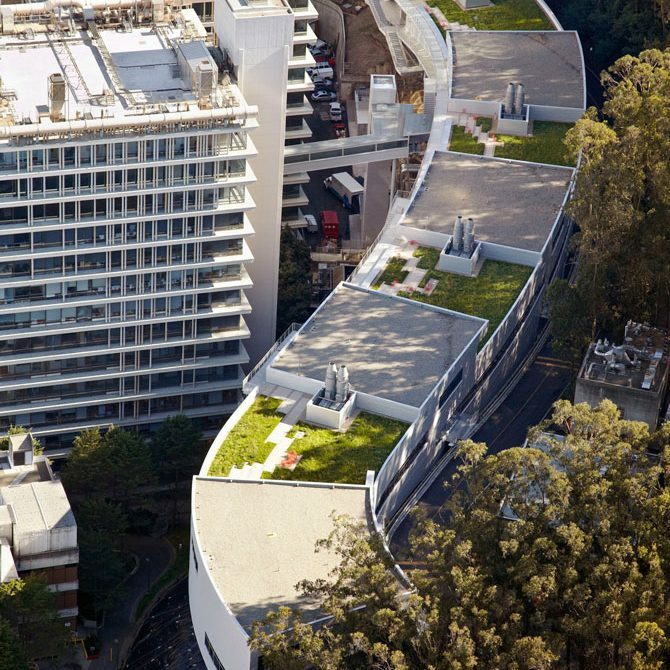 The University of California, San Francisco (UCSF), Regeneration Medicine Building, a 68,000 gsf, LEED Gold certified research facility is located on a steeply sloping site that provided unusual design challenges. Viñoly, working as Design Architect with SmithGroup as the Architect of Record, developed a terraced scheme that follows the curve of the site’s boundary street, and responds to researcher preferences by offering landscaped green roofs and open-plan laboratories with abundant natural light exposure. With its small footprint, this sweeping architectural gesture treads lightly on the site and adheres to green design principles. In a narrow location between a curving, sloped roadway and a full hospital complex, the building’s form and massing successfully negotiate its difficult site..